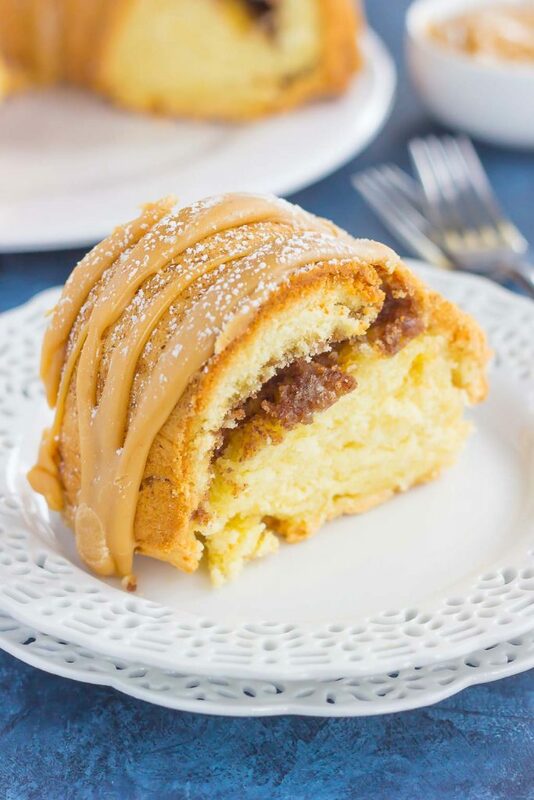 This Cinnamon Streusel Butter Cake with Caramel Icing is a decadent dessert that is sure to impress everyone. 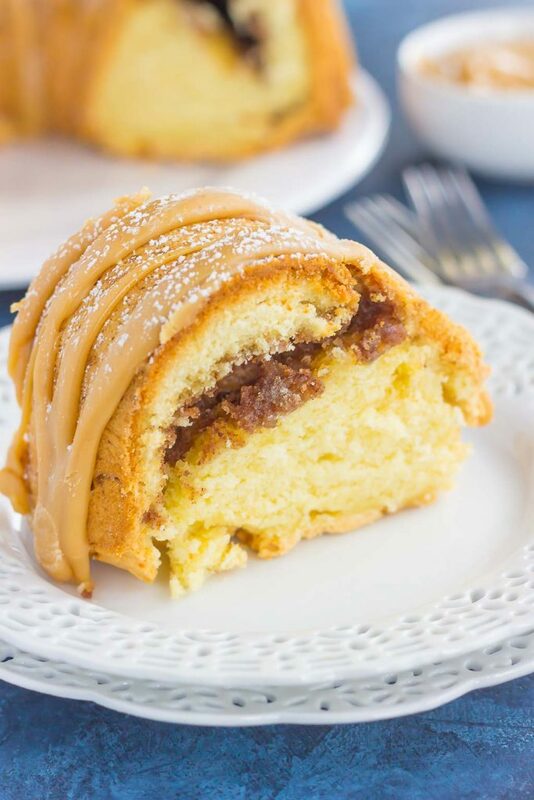 A moist and rich batter is sweetened with hints of butter, swirled with cinnamon streusel, and then topped with a rich, caramel icing. 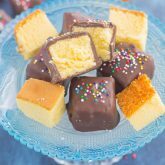 Easy to make and even better to eat, this cake will quickly become a favorite in your household! I’m excited to bring you this special recipe today because it’s the first Reader Recipe Favorite that I’m sharing on Pumpkin ‘N Spice! But, before I get into the delicious recipe, let me share how this came about, just in case you’re wondering! A few months ago, I opened a Reader Survey to get some thoughts, feedback, and suggestions of what you want to see more of on this site. One reader suggested that it would be fun to have people send in their favorite family recipes to feature for people to see. I thought that was an excellent idea, so I put my own twist on it! 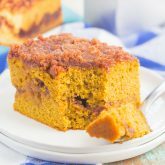 I sent out an email specifically to the subscribers of Pumpkin ‘N Spice, asking people to send in family favorite recipes that they love, with the intention of having it tweaked and shared on this blog. The response was overwhelming, and I’m so excited to dive into some recipes! And if you’re still interested in this new feature, but missed the original email, there’s still time! See below for the specifics on how to send in a favorite recipe of yours. But now, let’s talk about this cake. The first Reader Recipe Favorite was a butter cake recipe sent in by a very sweet reader, Margo. She has been reading my blog for a while and loves to give me new recipes or feedback on what I share with you. So, of course, I was thrilled when Margo sent in a favorite dessert that has been in her family for years. Margo provided me with detailed recipe instructions and also explained how her children always requested this cake for their birthdays. So, I couldn’t wait to try her butter cake! Now, if you’re an avid cake fan, I’m sure you’ve tried butter cake before, and probably love the airy texture and rich taste. It’s very popular in the south, and for good reason! It’s easy to make, contains simple ingredients, and is out-of-this-world good! I first made Margo’s recipe exactly as written and was very pleased with the results. The cake has an almost velvety texture, is slightly sweetened, and lighter on taste. My wheels were already spinning on how I could revamp this cake into a new version of sorts. 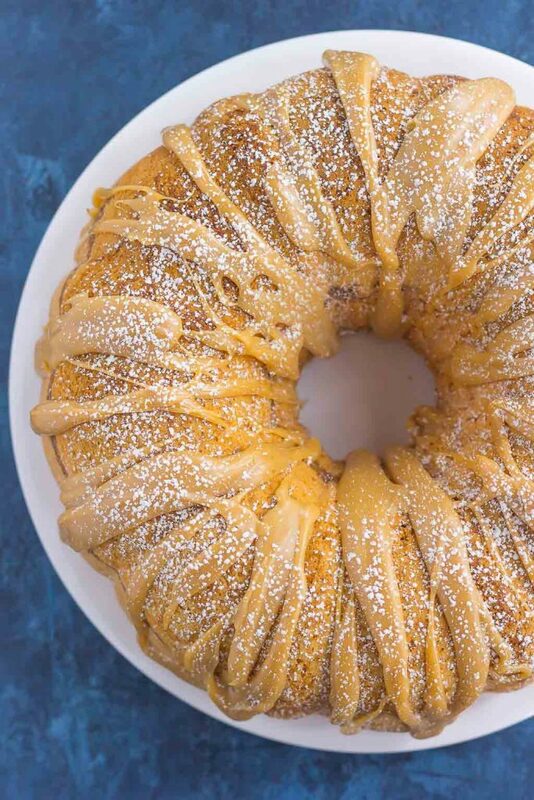 After several recipe tries (and fails) of trying to make it on the lighter side, I decided to stick with the same base and add in a swirl of cinnamon streusel and a decadent topping of caramel icing. After all, it’s called a butter cake because of the large amount of butter in here. Altering the recipe to make it ‘healthier’ just didn’t taste (or feel) right, so I left that alone. If you’re going to indulge in cake, it might as well be the good kind, loaded with calories…am I right, or am I right? If you’ve never tried butter cake before, now is your chance. Although it’s definitely not calorie-friendly (but we’re talking calk here, so it shouldn’t be! ), it’s one of the most simplest (and delicious) cakes that you’ll try. It reminds me of pound cake, but with a finer texture. 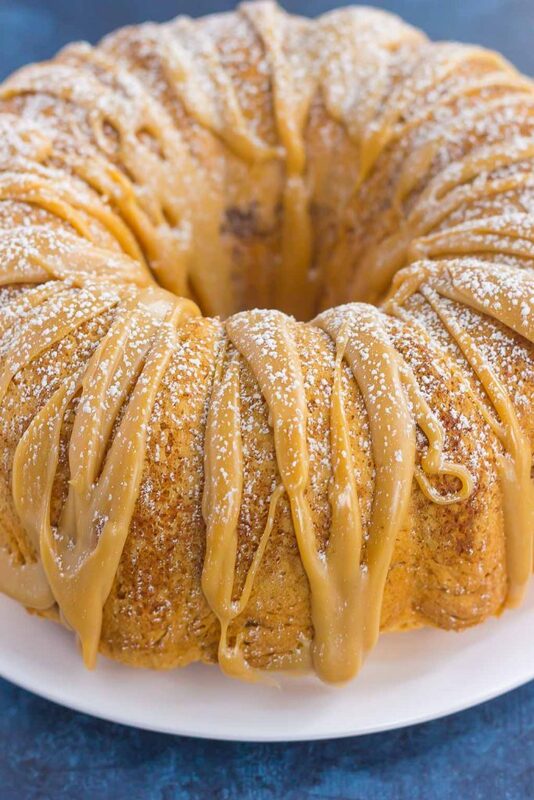 And when you add in a cinnamon streusel swirl and caramel icing? Be prepared to wow your taste buds. The flavor, the texture, the topping…swoon. I hope you love it just as much as I do! Interested in submitting a family favorite recipe to be tweaked and shared with the readers of Pumpkin ‘N Spice? If you have a family favorite recipe, maybe a breakfast dish, vegetable dish, chicken casserole, dessert, or whatever is a favorite in your family that you would like to share with the readers of Pumpkin ‘N Spice, I would love to put my own spin on it! Depending on the recipe, I will jazz it up with a few unique ingredients, make it healthier, low carb, less calories, or more indulgent to tweak it a bit. How I alter the recipe will be up to me. I’ll also photograph the recipe and share the ingredients and instructions with credit to YOU! I thought this would be a fun way to get more input on recipes that you love to make in your household. So, if this sounds like something you would like to participate in, send me an email at: gayle@pumpkinnspice.com (or simply reply back to this email) with the recipe title, ingredients, and directions. I’ll feature one recipe a month and put my unique touch on it. If you are selected, then I will notify you via email. Preheat oven to 325F. Generously grease a 12 cup bundt pan with non-stick cooking spray. Alternatively, you can grease with a softened stick of butter. Set aside. To make the streusel, combine the flour, white sugar, brown sugar, cinnamon, cinnamon, and vegetable oil using a fork until mixture resembles coarse sand. Set aside. 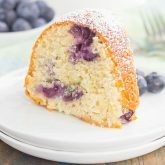 To make the cake, in a large bowl, beat butter and sugar using a stand mixer with fitted paddle attachment or electric hand mixer for 4-5 minutes, or until light and fluffy. While mixture may be fluffy after several minutes, the key is a light and airy texture, so the longer you beat the ingredients, the better. Add in eggs, two at a time, followed by vanilla extract, and mix well. Add flour, 1/2 cup at a time, beating well after each addition. Spread half of batter into prepared pan. Sprinkle streusel on top of batter and lightly press down to ensure it sinks in. Spread rest of batter on top of streusel. Bake for 50-55 minutes, or until toothpick inserted into center comes out clean. Let cool in pan for 5 minutes, then flip onto a plate to cool completely. To make the caramel icing, combine the sweetened condensed milk and brown sugar in a medium sauce pan. Heat over medium and whisk frequently. Bring mixture to a boil, then reduce heat and simmer for 7-8 minutes, stirring constantly. Remove from heat and stir in butter and vanilla extract. Drizzle over cooled cake immediately, as mixture will harden if left out too long. Wow -- such a beautiful cake! Love how you made Margo's original even more decadent! What a gorgeous (and delicious) cake, Gayle! That was such a great idea to get some feedback from your readers! 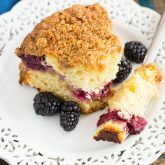 Loving that cinnamon streusel in there and I don't mind all the butter....like you said it is cake after all! That drizzle on top looks so pretty too. I'd almost not want to cut into it and maybe just stare at it for a while, ya know? Pinned! Thanks to you (and your reader) for sharing! Have a wonderful weekend, my friend! Thanks so much for the sweet comment and pin, Dawn! YESSS! Sometimes we just have to indulge in cake. And since it's the weekend, calories don't count...right? :) Hope you have a great weekend, too! Gayle, this looks amazing and just what I want to be baking this weekend! What a great idea polling your readers for their favorite recipes Gayle, and it looked like it really paid off! 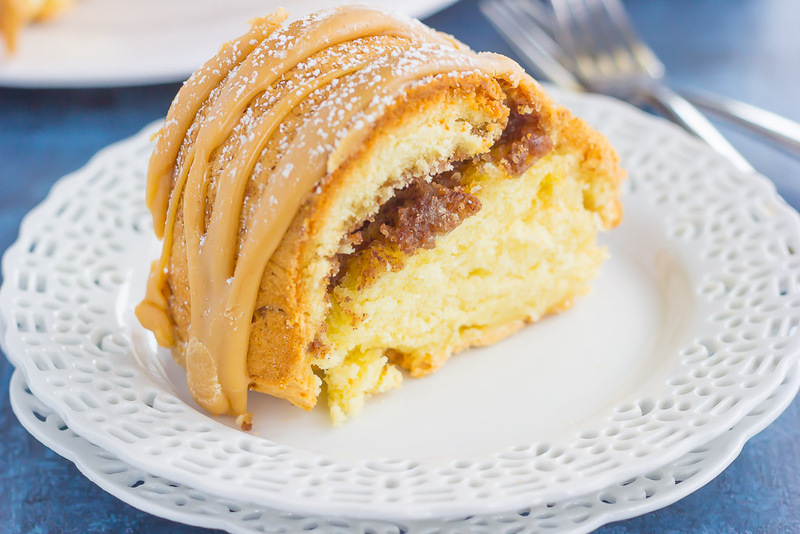 This cake looks so moist and giving it a cinnamon streusel AND caramel icing was such a great idea. This is one stunning dessert! Thanks for the sweet comment, Marcie! This is such a sweet idea to feature your reader's recipes, and this cake looks like an AMAZING one to start with! Swooning over that streusel and the icing...yum! I'm not too upset that the lighter version didn't work! ;) This looks just as it should be - all buttery and sweet! Love the concept, Gayle! Thanks for the sweet comment, Annie! I love the idea of reader recipe favorites, and this cake! OH MY GOODNESS!! Pinning! Thanks for the sweet comment and pin! This is such a fun idea - to feature reader's recipe! I love baking and I'm very excited to try this cake! Looks perfect! Thanks for the sweet comment, Demeter! Happy weekend to you! Hi Gayle, This cake looks so amazing, you have ticked all of the boxes for me with caramel, cinnamon with a nice buttery cake to complete the whole package. I cannot wait to make this and I truly hope it comes out half as good as yours looks. Your photography is amazing by the way, I can almost smell the cake. Thank you for the kind words and for stopping by, Lee! I hope you love this cake if you try it!